First and foremost, Hoodoo is not a religion. Those who practiced Hoodoo were usually Christian because during this time period there were mainly English speaking missionaries publishing literature. Hoodoo is a belief system of practices. Hoodoo is based of two types of conjures. One is the wisdom that is passed down and the second is the knowledge of how various herbs and spirits can work towards an individual when used as a magic. The Hoodoo culture is practiced around both the herbal and natural remedies of the earth. The use of magic is more of the person heading the ceremony becoming in touch with the world around them, the different pieces of material they used to identify an individual and connecting with spiritual entities. This is often done to predict or change a fate of an individual. Hoodoo has been twisted over the years mainly due to the slave trade. 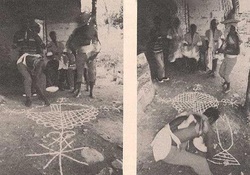 When African’s were taken captive from all over the continent of Africa, the very different types of Hoodoo was blended together which has shaped what we can see today. Those who practiced Hoodoo used it as a way of protection during the dangerous times of the slave trade. They would use their spirituality to project safety over their family and attempt to change the fate of their loved ones. There are many different types of “conjure ceremonies” used in Hoodoo. The most common of them is the use of candles. These candles are made from a variety of herbs and colors to represent different fates, influences and powers during a ceremony. It is claimed that as a candle is burned, the spiritual powers that are represented by these properties are released through the flame. Candles are representative of people and they are used for love, food fortune, money and safety. We see decorative items today in little bags with designs. These are derived from the Hoodoo “Mojo Bags.” These bags were prepared by the magic helper personally, and are said to have highly personalized and powerful properties such as herbs, rocks and materials. These Mojo bags were help by it’s keeper at all times to ensure they were able to stay in touch with their own powers.